Steer your way into an exciting unit of vehicles and things that go. 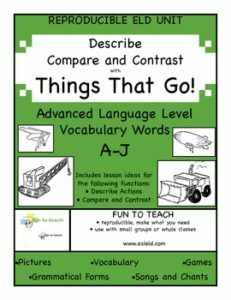 THINGS THAT GO focuses on the grammatical forms necessary to describe and to compare/contrast. This set contains 5 reproducible units one at each level of language instruction: Beginning, Intermediate, and Advanced. Each unit has approximately 51 pages.